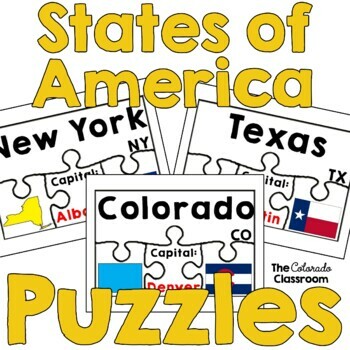 States of America Puzzles will help your students learn the basics of each of the 50 states in a fun and interactive manner. 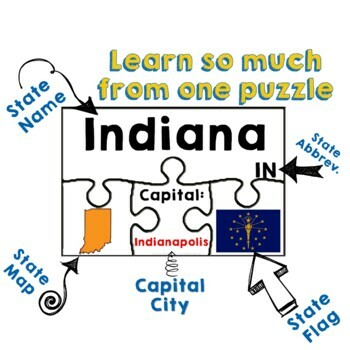 Puzzles feature the name of the state, the capital, an outline map of the state, and the state flag all for matching. Students can then take them apart, mix them up, and work on correctly matching all 50 states, or complete them by regions. Answer keys are provided. 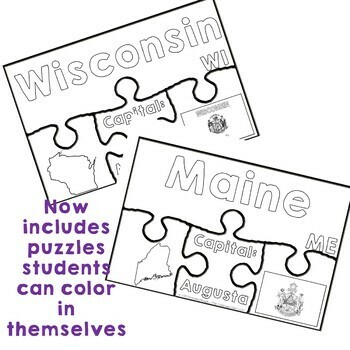 Now includes postal code abbreviations and blank puzzle pieces students can color in for themselves. Be the first to know about my new discounts, freebies, and product launches. Receive email updates about this store.